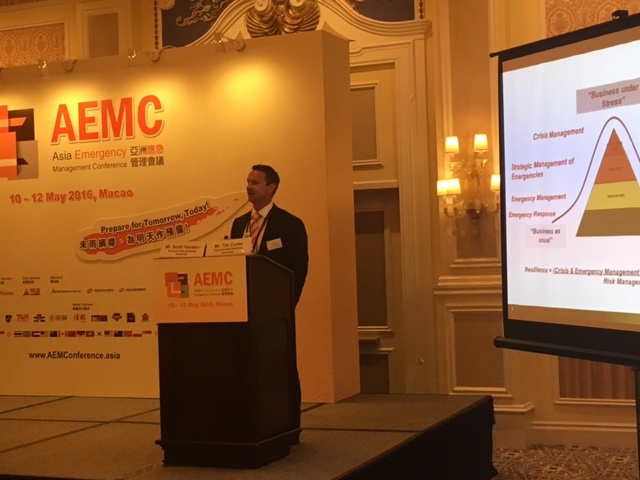 Tim Curtis, Director for International Operations and Scott Houston, CEO attended the Asia Emergency Management Conference this week in Macao. Tim Curtis ‘s presentation and workshop was about training and exercising a crisis management team before the “Tiger” start chasing you. In our experience crisis and emergency management plans and procedures need to be highly applied and practical. There is no time to read them when the tiger starts chasing you. Brevity and simplicity is key. Training and exercising your crisis management team is the secret to its success. Develop business continuity plans dependent on the risk profile of the organisation.